A short, simple yet poignant read, looking into the mind of a 15-year-old who has Asperger's syndrome. The Curious Incident of the Dog in the Night-Time is a unique read for me. I have read a book with an Asperger patient in it (Dear John by Nicholas Sparks) but I haven't read anything where he/she is the main character/narrator. Christopher deals with things in a very rational, literal way and does not relate to people very well. Going out of his boundaries and diverting from his routine is very unusual, if not happening at all. So when he discovered Wellington's body, he set his foot off his usual course to solve a murder mystery. It was quite a refreshing read. The mundane tasks were given new light by looking at them in Christopher's eyes. It's an eye-opening reading experience and interesting to see in Christopher's perspective. I liked the progression of events and how they are all connected leading to Christopher's adventure. While reading, I was eager to know who killed Wellington, and later on, to know how things will turn out for Christopher and his family. The story has an open ending, but I liked that it gives hope of resolution for Christopher's relationship and future. The hanging threads were also somehow tied in the end. It may not be a concrete happy ending but it's a positive one. Christopher is an interesting character. If one does not know that he has Asperger's syndrome, I don't think he'll be likeable to them. Having a very logical mind can be challenging for the people around him and for him. But I liked how Christopher made an effort to change his routine and get out there to reach a certain goal. As for the secondary characters, I don't think I like them at all. Haha! They're not perfect, I know. And they do what they think is the best for Christopher. But cheating is cheating, and lying is lying. In general, I think the characters are all well-written. They are all three-dimensional, reflecting the different nature of a person given a certain circumstance. The style of writing of the author is okay. I was not 100% amazed by it, but I still liked it nevertheless. Written in a first-person perspective, in Christopher's POV, I was able to see things in Christopher's eyes, and experience things from his perspective. What I especially liked is the way The Curious Incident is presented as the book written by Christopher. I think it's a unique way of story-telling and I have never read anything like it before. I also liked the inclusion of some historical events and scientific facts, stated in an FYI manner. There were some points I was not able to understand and some mathematical problems I was very clueless about, but otherwise, it was easy to follow Christopher's story. Mark Haddon is a British novelist and poet, best known for his 2003 novel The Curious Incident of the Dog in the Night-time. He was educated at Uppingham School and Merton College, Oxford, where he studied English. In 2003, Haddon won the Whitbread Book of the Year Award and in 2004, the Commonwealth Writers' Prize Overall Best First Book for his novel The Curious Incident of the Dog in the Night-time, a book which is written from the perspective of a boy with Aspergers syndrome. Haddon's knowledge of Aspergers syndrome, a type of autism, comes from his work with autistic people as a young man. In an interview at Powells.com, Haddon claimed that this was the first book that he wrote intentionally for an adult audience; he was surprised when his publisher suggested marketing it to both adult and child audiences. His second adult-novel, A Spot of Bother, was published in September 2006. 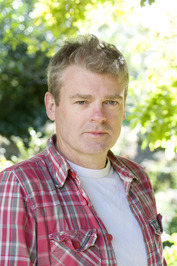 Mark Haddon is also known for his series of Agent Z books, one of which, Agent Z and the Penguin from Mars, was made into a 1996 Children's BBC sitcom. He also wrote the screenplay for the BBC television adaptation of Raymond Briggs's story Fungus the Bogeyman, screened on BBC1 in 2004. He also wrote the 2007 BBC television drama Coming Down the Mountain.